The Superior Inter Religious Council will participate in a permanent manner as an advisor before any project that the OMPP/WOFP, presents to the UN, UNESCO and any other International Organization, in the aid of a Culture of Peace. 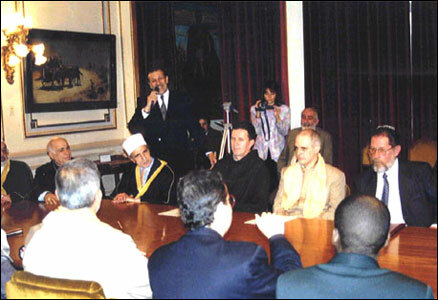 The Superior Inter Religious Council (SIC) is composed by representatives of different religions and cults, whom take part in quarterly assemblies of exchange and proposals of programs which have been produced jointly, with the Communicators Councils (CC). This council is made up in its majority, by representatives of international news media joining efforts together, for the development of the first program of the World Organization for Peace, so-called “University of Superior Studies for a lasting Peace”. With the purpose of beginning a second program denominated “Educating for Peace” to be developed in over 190 countries, focused at all educational levels. “Educating for Peace” will be presented before the UN and UNESCO, for it to be raised to the Ministry of Education of the member countries of the United Nations for its execution. The means of communication, represented by its directors before the WOFP in the (CC), will have the responsibility of spreading these programs in a massive and steadfast manner, contributing in this form in favor of a culture of peace and for a general welfare. This program will be developed during the years 2006 and 2007, in the sessions of assemblies of the WOFP which will be take place bi monthly or quarterly, where the department “All for Peace” “All Together in the Name of Peace”, made up by more than 470 Foundations and Organizations that work in different countries in favor of peace, they will present their projects to the WOFP Central Committee, from there it will be moved to the SIC and to the CD for its evaluation and acceptance. The Central Committee will be composed by a delegation of investigators and professors, among them Deans of 24 Universities in different countries. The religions and the mass media come together for peace. The WOFP together with their counsel of advisors has brought together mass media authorities from all over the world, advisers and relation officers to spread the message of this Organization in favor of a peaceful culture. In addition, the Organization gathered together an honorable council of well known international personalities, who work in favor of culture and peace in a permanent manner, having established the Higher Interfaith Council (HIC), formed by minister of different religions and cults. The President of WOFP Carlos Peralta, giving a conference on peace to various religious ministers , here we can see Christians, Jews, Muslims, Hinduism, Buddhist as well as other religions.